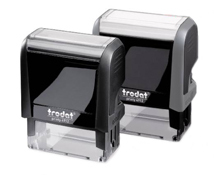 This popular line of Trodat stamps is manufactured with climate-neutral practices. The two-grip design allows you to change the ink cartridge without touching the pad. Small and light-weight, these stamps can be used on the go as well as at home or the office. Custom self-inking stamp, up to 2 lines of text. Impression area: 3/8" x 1-1/32"
Custom self-inking stamp, up to 3 lines of text. Impression area: 9/16" x 1-1/2"
Custom self-inking stamp, up to 5 lines of text. Impression area: 3/4" x 1-7/8"
Custom self-inking stamp, up to 6 lines of text. Impression area: 7/8" x 2-3/8"
Custom self-inking stamp, up to 6 lines of text. Impression area: 1" x 2-3/4"
Custom self-inking stamp, up to 2 lines of text. Impression area: 3/8" x 2-3/4"
Custom self-inking stamp, up to 4 lines of text. Impression area: 5/8" x 3"
Custom self-inking stamp, up to 7 lines of text. Impression area: 1-9/16" x 2-3/8"
Custom self-inking stamp, up to 8 lines of text. Impression area: 1-1/2" x 3"
Custom self-inking stamp, up to 3 lines of text. Impression area: 1/2" x 1/2"
Custom self-inking stamp, up to 4 lines of text. Impression area: 13/16" x 13/16"
Custom self-inking stamp, up to 6 lines of text. Impression area: 1-3/16" x 1-3/16"
Custom self-inking stamp, up to 6 lines of text. Impression area: 1-3/16" x 2"
Custom self-inking stamp, up to 6 lines of text. Impression area: 1-5/8" x 1-5/8"
Custom self-inking stamp, up to 3 lines of text. Impression area: 1-5/8 diameter. Custom self-inking stamp, up to 6 lines of text. Impression area: 1-5/8 diameter. Custom self-inking stamp, up to 5 lines of text. Impression area: 1-3/4 diameter. Custom self-inking stamp, up to 8 lines of text. Impression area: 1-3/4 diameter.